We recommend that you leave at least an hour before feeding your child. 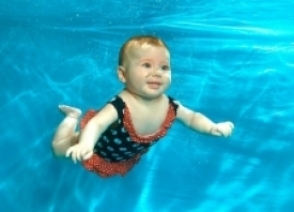 If your child is not yet potty trained, please ensure that your child is wearing a swimming nappy that is snug around the thighs and waist to prevent any accidents in the pool. These can be disposable (available from supermarkets and larger chemists next to the normal nappies) or reusable. We recommend the Happy Nappy, made of 1mm supple, stretchy neoprene and finished with supper soft, snug fitting, deep bands of fabric with high rubber content to keep all nasties inside. They retail for approximately £8. You will need to bring along your own towels and for babies, we recommend that you bring something to change them on. Changing tables can get very busy before classes. Always bring a towel poolside to maintain the children’s body temperature after swimming. Do make sure that you dry the children’s hair and wrap them up well in the cold weather to keep them warm when they leave the venue. 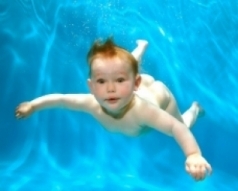 Young children will often sleep very well after a swimming session – an added bonus! Please be aware that the swimming pools are sometimes out of action due to circumstances beyond our control (usually broken boilers, water temperatures or soiling in the pool. In such cases cancelled classes will roll over and continue after the pool is back in operation so that you will always finish your 5 week course. In these circumstances, you will always be contacted by text or called directly just as soon as we are aware of a problem. We will also send out an explanatory email with details of revised course dates. Our courses are 5 weeks long. On the third week you will be emailed to find out if you would like to book on to the next stage of your course. You can either let the teacher know, email or call us to rebook. You will have first refusal of places on the next or subsequent courses. We ask that you do not bring your baby to classes if they are poorly. They are unlikely to enjoy the classes if they are under the weather and could pass their illness on to the other children. Please note that we are under no obligation to refund your money or issue credits for classes in the event that you or your are unable to attend part or all of the course. Unfortunately, our costs remain the same, whether or not everyone is present. We ask you to be ready at the side of the pool to begin the class promptly at the time stated. Should you cancel at any time prior to the week before the course begins we will issue a refund. In the week prior to the course, we will issue a refund less a £10 administration charge.